Our Park Western Place PTA plays a vital role in our school community and we support many different programs, events, campus improvements and activities through the year. We do this through membership fees from families and teachers, but most of our money comes from donations and PTA fundraisers. We need all of our families to support our PTA both financially and as volunteers so that we can continue to provide these great services to our school. In the end it's our own kids who benefit. Below you can see some of the easy ways that you can make your regular every day purchases count toward helping our school earn cash and supplies, and don't forget to support our annual fund raisers. We really can't do this without you! ﻿Register your Ralphs Rewards Card online. Link your card to Park Western PTA. Ralphs will donate 1-4% of eligible purchases to our school! In the fall we bring in a great selection of books to choose from. We also let the teacher's choose books for their classrooms and you can pick and donate from their lists. Find Box Tops on hundreds of products. Clip Box Tops from the package. Send the Box Tops to school in a baggie or on a collection sheet. Our school earns 10¢ for each Box Top! 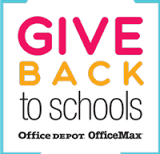 Simply make a purchase of qualifying school supplies. Give Park Western's school ID (70014645) at checkout. Or just ask them to apply your purchase to Park Western Place Elementary. It's really that simple! Our school will receive 5% back in credits for FREE supplies! ﻿Support our 5th Graders on their Catalina Island Marine Institute trip in the Spring. Purchase delicious varieties of popcorn for your family & friends!